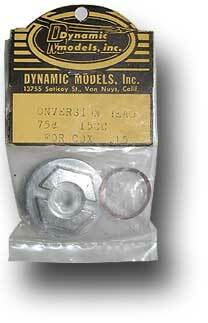 There was a huge number of 3rd parties who were offering accessories to soup up Cox engines or to add features that were not available from Cox. This page shows only a few products from these manufacturers, which often were small enterprises or individuals producing small batches of parts at a time. 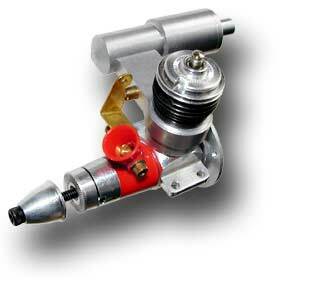 This accessory was intended to be mounted on the TD .049 and .051 engines. 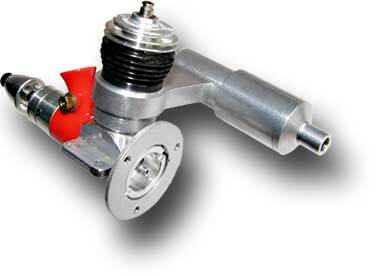 The carburetor throttle part was quite similar to the one used in the Cox sliding exhaust throttle set for the Medallion series. The original TD venturi was replaced by a plastic Medallion carburetor part with a rotating throttle bar. Instead of the simple Cox exhaust throttle system, a real muffler was supplied, which contained an exhaust throttle valve. This was activated by the throttle lever, when the idle position was reached. The lever pushes against the spring loaded sliding brass pin, which restricts the exhaust area. This particular engine is also equipped with an additional firewall mount and a crankcase cover with a pressure tap. The mounting ring is cleverly captured between the crankcase and the rear cover. Both parts were produced by Joe Klauses's "Kustom Kraftmanship". 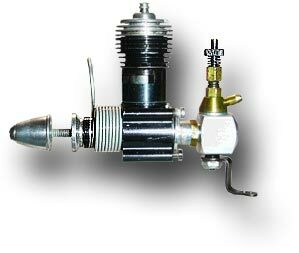 Made in Quebec, Canada, this was a quite sophisticated carburetor with a fixed bleed air hole and idle stop adjustment screw, modeled after larger model engine carburetors. An unique feature is the integrated “friction clutch” permitting it to override when the throttle valve reaches its limit stops (US Patent 3,784,174). It could be used on .049 and .051 Tee Dee engines. A similar design was later produced by Cox and used in the Cox Tee Dee .050 R/C engine, which also came with an effective muffler. 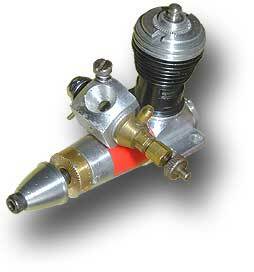 The same R/C carburetor was available to be mounted on the rear induction reed valve engines. Here the complete tank/backplate assembly was replaced by a metal housing very similar to the very early backplates as used e.g. in the “Shinn” aircraft model. This part contained the original reed valve with its retainer ring and provided a threaded stub to attach the carburetor. The whole assembly was either held together by screw2s reaching through the firewall or by completing the set with an additional sheet metal engine mount. 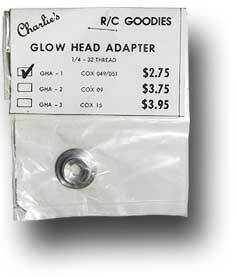 Cox glow heads were good to achieve maximum power output, but also were quite costly. This resulted in several individuals and small companies to produce cheaper replacement parts or alternative solutions. Companies like Charlie's R/C Goodies or Dynamic Models Inc. produced glow plug adapters for the .049/.051, .09 and .15 engines. 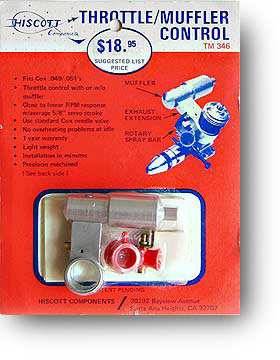 Besides these adapters shown above, Dynamic Models Inc. also produced glow heads (two heads for .09 and .15 engines shown on the left hand side of picture). A different solution was presented by KK (Kustom Kraftmanship) using a ring adapter which allows the usage of the Nelson Glow Bee plug on .049/.051 engines (see upper right and enlargement below). Some people prefer to get rid of expensive glow heads and use the self ignition effect caused by high compression. For this purpose, Davis Diesel Development produces replacement heads for selected Cox engines. Not all engines are suited to operate under the higher loads caused by Diesel operation. Davis supports the .020 Pee Wee, the .049/.051 Tee Dee and Medallion and .049 reed valve engines equipped with a special heavy duty crankshaft. Note: while these model engines are called Diesel, they are not really Diesel engines - these inject fuel into the compressed, hot air inside the cylinder, whereas the model Diesels use conventional carburetion. In order to support ½-A control line speed and proto contest flyers Cox offered this speed pan. An extremely low weight of 23 grams was achieved by using Magnesium for the casting. This is to be compared to a 10% shorter speed pan produced in aluminum by Tatone which weighs 33 grams. The motor mounts had already been drilled and tapped for a Tee Dee .049 engine. The instruction sheet strongly recommends to use a left handed crankshaft (for counter clockwise flight) to avoid that the model turns into the circle. 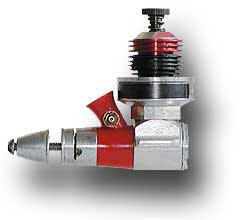 These special crankshafts as well as matching propellers were also available from Cox in these years. These items had been developed mainly by Dale Kirn, who also developed some well known Cox models like the “Spook”, “Spitfire”, “Corsair”and the Buck Rogers “Starfighter”. Under usual atmospheric conditions Magnesium quickly forms an ugly black oxide layer and tends to corrode easily. Therefore it is important to conserve the material by a layer of clear lacquer. The upper fuselage shell shown in the picture was produced by a local modeler from glass fiber cloth and polyester resin, adding another 9 grams to the mass of the fuselage.